Flying with legally-purchased pot? Be careful. In January, California joined the growing list of places where the sale of recreational marijuana is allowed and now one in five Americans lives in a state where buying pot can be a tourist activity. 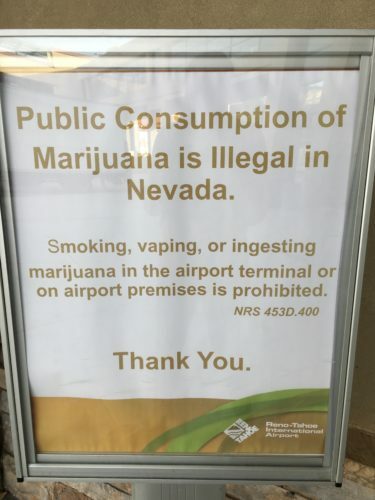 Marijuana is still an illegal drug under federal law and post-security areas at airports are ruled by federal agencies. So, as in Oregon, Washington, Colorado, Alaska and Nevada, bringing legally-purchased pot past a security checkpoint in the country’s most populated state can still get you into hot water. The Transportation Security Administration says its officers remain focused on security and detecting weapons, explosives and other threats to aviation and passengers – not on sniffing out drugs. But if a TSA officer does finds marijuana or another illegal substance during the security screening of carry-on or checked baggage, the policy is to call in local airport law enforcement, said TSA spokeswoman Lorie Dankers. To alert flyers to the rules about traveling with recreational pot purchased legally in California – and to advertise their cannabis company – in November Organa Brands ran an ad in the bottom of the bins at the security checkpoints at Ontario International Airport. “We were very confident in the positive message that the trays carried,” said Organa Brands spokesman Jackson Tilley, although the company wasn’t too surprised when a month into the campaign the airport asked that the cannabis messages in the trays be removed. “If the landscape changes and cannabis ads are welcomed in airports, we’d be thrilled to run a campaign again,” said Tilley. There are currently no marijuana-related checkpoint tray ads, signs or ‘amnesty disposal bins currently at the San Francisco, Long Beach or other California airports contacted for this story. But in Nevada, where sales of recreational marijuana became legal in July, 2017, it’s a different story. This is the third installment today of airports using Twitter to stay in touch with travelers. I’ll try to put these all together in a single directory/list and post it separately on the Stuck at the Airport site. Any airports we’re missing? Rickenbacker International Airport (Columbus, Ohio)- @RickIntlAirport.